a click on the Edit this tool preset button in the button bar of the Tool Presets Dialog. 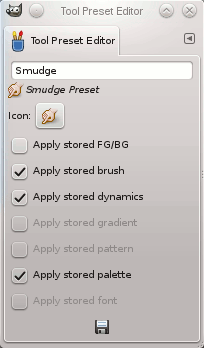 a double-click on a preset icon in the Tool Presets Dialog. a right-click on a preset in the Tool Presets Dialog to open a context menu and then click on the Edit Tool Preset command. You can edit presets you have created only; all options of predefined presets are grayed out and disabled. change preset icon by clicking on preset icon. This opens a window where you can choose a new icon. select resources to be saved by clicking on check boxes.